Click here to see what Biomex* riders are saying about their experience with this new technology. 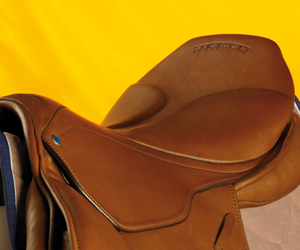 Biomex* is available on all Stübben saddles except for our Youth and Icelandic models. Many riders (studies say over half) suffer from back pain, especially after they ride. 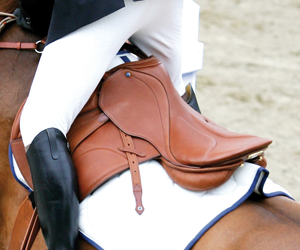 When riding on a horse, the force exerted on the spine flows mainly through the seat bones. Pressure on these seat bones and the extremely sensitive soft tissues around them can cause pain. 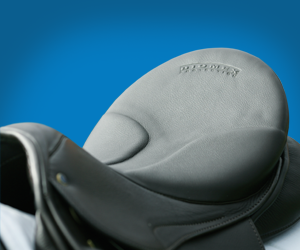 The Stübben Biomex* cushions the seat bones with two kidney-shaped pads, which absorb impact and relieve spinal stress. In addition, the depression between the kidney-shaped pads also plays a crucial role, as it substantially lessens any possible pressure on the soft tissues surrounding the seat bones (see the oval areas on the diagrams below). 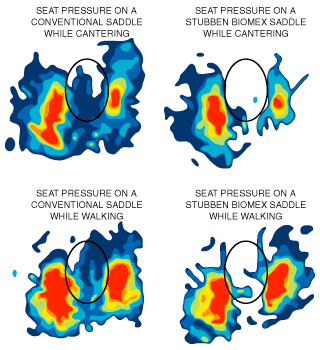 In scientific comparisons with conventional saddles, seat pressure measurements at various gaits show that the Stübben Biomex* provides much greater relief in the seat bone area and the surrounding soft tissues. Peak pressure on the seat (Ischial) bones was reduced in all gaits (red areas). The black ellipses mark the position of the soft tissues between the seat bones. The pressure on these sensitive soft tissues was also reduced in all gaits. The Stübben Biomex* can lead to reduced back pain, pure and simple. 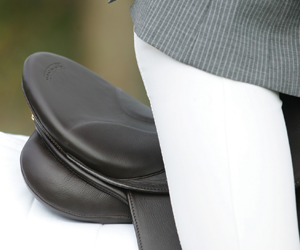 It also promotes good riding posture and protects your most sensitive areas (and it’s a Stübben, so you know it’s good for your horse). * Our Biomex Design is Patent Pending.